Slow-or-no-water-into-the-washer and flooding washer complaints just gotsta be in the top five most frequent appliance complaints I get. Thang about it is that it’s just so gawd-awful simple to fix that I’m reluctant to give away the secret to this great cash cow. Yeah, I know, I shouldn’t reveal this treasured trade secret that all appliance repair techs swear an oath to defend. What? You say you want me to tell you anydamnway? Well alright then. Most of the time, your water flow complaints will be about either the cold or the hot water being restricted to near nothing. Sometimes, both the hot and cold water flow are restricted and the water just trickles in no matter where you got the temp control set at. Either way, 90% of the time, the problem is because of sediment built up on the inlet screen of the washer inlet valve. 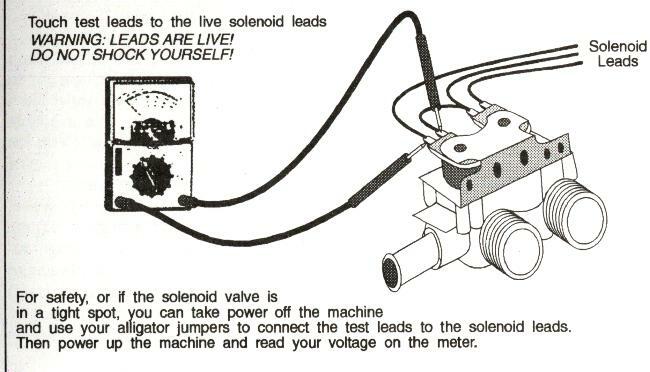 Here’s a typical two-solenoid inlet valve. This is the most common, although some Whirlpool’s use a three solenoid arrangement, but the diagnosis and correction are the same. Most of the time, what happens is that sediment builds up on the inlet screen of the solenoid valve and restricts the water flow into the valve. Now, here’s where you can benefit from my lifetime experience as a certified technical guru. There’s something I call the "cute plumber’s trick" where the unsuspecting appliance owner calls in one o’ them real hairy, stinky plumbers to fix their washer. Well, Buttcrack Bubba correctly takes a look at the inlet valve and figgers he’s being reeeel cute by just removing the inlet screen altogether. Most of the time, Buttcrack Bubba does this ’cause he ain’t even got a washer valve on his truck so it’s the difference between making something off the job ’cause he "fixed" it, or making next to nothing ’cause he didn’t have the part and he’d have to come back to do the repair. Buttcrack Bubba’s in, what we in the trade call, "the horns of an enema." Yessir, so he goes ahead and removes that screen. The customer don’t know any better; heck, all he knows is that water’s flowing to his washer again. It’s a freakin’ miracle! What happens next, though, is a sad tale to tell. Y’see, after a while, the innards of the valve get so gunked up with sediment that the valve can no longer stop the flow of water when it’s supposed to (like, when there’s no power on it). You can see here that they’s a whole buncha delicate leetle bitty parts in there, da, comrade? Little, itty-bitty pieces of dirt and pipe scale can stick that plunger guide wide-ace open. So, water just keeps on flowing into the washer. Meanwhile, you’re outside playing with the dog, or changing a poopy diaper, or…whatever. Point is, the washer floods on you and makes one helluva mess in your house. All cause o’ that "cute plumber’s trick." Now, how smart was that to call in a plumber to do an appliance tech’s job? Other times, problems with no water can be the pressure switch or a burned-out solenoid in the water valve. If there ain’t much sediment on the inlet screen of the water valve, you gotsta measure the continuity of the solenoid coil at the terminals. If your meter says there’s no ohms in the solenoid coil, that sucker is slap-open and it’s gotta be replaced. That’s the name o’ that tune, Hoss. If solenoid continuity is OK, then you may need to measure the voltage at solenoid coil. This is a live test, meaning the circuit will have 120v on it, so you can get your hind quarters shocked off if’n you ain’t careful, Slick. If you ain’t getting 120v to the valve during the fill portion of the cycle, then you need to check the pressure switch, or fill switch. This entry was posted in Washer Repair on December 26, 2002 by Samurai Appliance Repair Man.